Are you having plumbing issues in the Flatbush area? Call Petri Plumbing today at (718) 748-1254 for our immediate plumbing services in Central Brooklyn. Are you looking for someone who can reliably help you with your house when you need it? At Petri, we have skilled and experienced plumbers serving Flatbush, Brooklyn and the surrounding areas. Call us today and let us help you get your house back to normal so you can get your life back to normal. At Petri, we take pride in knowing that our jobs go beyond the services we perform. You need your house to work well so that you can focus on the things and people that you love. With every call, we aim to make your life easier. We can’t take the problems away, but we can fix them fast and offer the best service in Brooklyn! 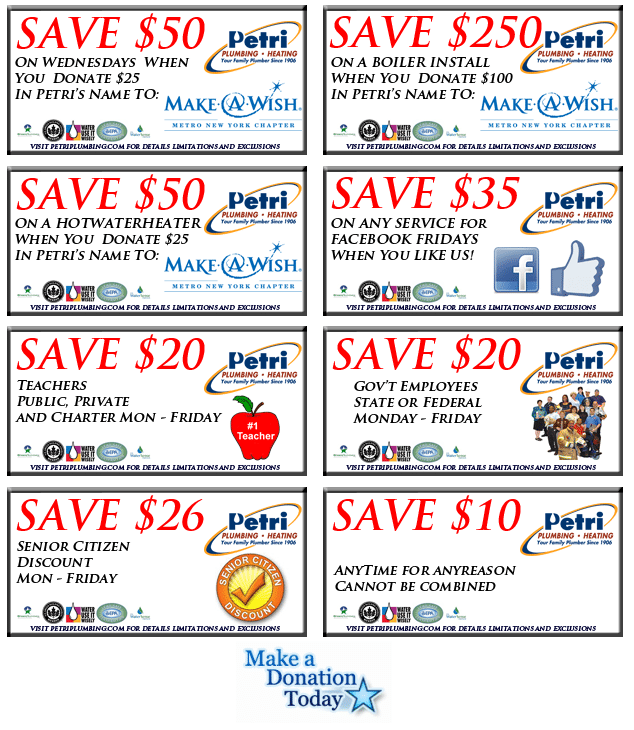 Call us to experience the Petri difference today. We’ll handle all sorts of plumbing problems, from the things that annoy you to the ones that threaten your health and safety. We’ll unclog your drains, clean out your sewer, help you get a new water heater, or troubleshoot your garbage disposal. Whenever you need help with plumbing in Flatbush, Brooklyn, we will be there to stand by your side. We are also available to help with plumbing emergencies. When water or sewage are backing up into your house and you don’t know what to do to make it stop, call us. We have plumbers standing by 24 hours a day and 7 days a week because we know that these things don’t always happen at times that are convenient for you. Call us at night, over the weekend, and even on holidays, or whenever your plumbing emergency arises. Take a look at what your neighbors are saying in our customer reviews. What Could Be Affecting My Toilet? You would be surprised by what we have removed from clogged toilets. If you have small children in your home, the toilet is the perfect dumping ground for random objects. We have even found candlesticks and grocery food items that serve to clog up toilets. We have also found in many cases that one of the most frequent reasons for toilet clogging is too much toilet paper being reeled off and dumped in it. Too much toilet paper going down at once swells the paper to twice its size. The paper then becomes stuck, and then the toilet overflows onto the bathroom floor. Of course, the problem of clogged toilets can be more complicated. If you have an older toilet, it could be a weaker toilet model that might have been manufactured between 1994 and 1997, which means it is a low-flowing water toilet. You may consider upgrading to a newer toilet. What are Some Water Heater Problems? One of the most common water heater problems that plumbers come across is a water trail that leads directly back to your water heater. A crack in the tank’s interior is responsible for leaking at the bottom of the water heater, and this requires that the water heater must be replaced. A leak emanating from the top of the heater indicates that a plumbing part has malfunctioned. Contact plumbing experts to fix these problems. When the pilot light cannot be lit on a gas water heater, this indicates that there may be a part that is not functioning. If an electric water heater stops supplying hot water, the breaker may have tripped. A faulty thermostat can cut off the hot water flow as well. When you encounter no hot water, immediately determine whether the breaker is functioning properly. For the best Flatbush plumber, call Petri Plumbing at (718) 748-1254.